The loose comfortable fit of this lovely women’s duster is but one of its many fine qualities. 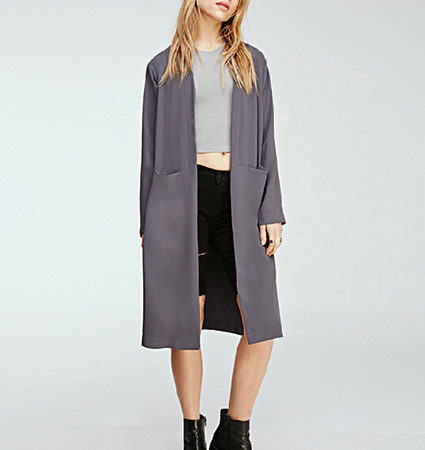 This duster is great to toss on over any outfit to add a third layer that unifies the whole look. It features long, loose sleeves that stop at the wrists. The hemline of the duster ends just below the knees. It is a lightweight, unlined garment that has no buttons or zippers. It features two deep front pockets. The duster is presented in two color choices. Select your favorite from a medium shade of dove gray, or a very pale pink-beige. It is machine washable. This duster is available for purchase in sizes Small, Medium, Large and Extra Large.